Myth #1: Sugary food is THE cause of cavities. Cavities are caused by acid produced when mouth bacteria digest carbohydrates—any simple carbohydrates. Yes, carbohydrates include sweets like candy and breakfast cereal, but they also include crackers, bread, whole grain foods of any sort, chips, potatoes, etc. In our Orem, UT office we don’t see an uptick of cavities in kids after Christmas, Easter, and Halloween because candy is just one of many things that promotes tooth decay. Similarly, it drives me nuts to hear my wife bash delicious cereals like Cocoa Krispies and Lucky Charms (which are awesome) in favor of promoting “healthier” options for my family for dental health reasons. The “healthy” stuff causes cavities too! Myth #2: Some people have “soft” teeth. Your enamel is just as strong and protective as anyone else’s regardless of what your parents tell you about heredity. Although “soft teeth” might be a common excuse for being cavity prone, it just isn’t true. Now, don’t get me wrong, because there really are some extremely rare conditions out there which do result in weak teeth, such as a group of conditions called amelogenesis imperfecta, which causes thin, malformed enamel, but these conditions are way too rare to account for the high number of people who claim “soft teeth.” More likely reasons for being cavity prone are a history of less than optimal hygiene over a lifetime, no fluoride treatment during childhood, infrequent cleanings and checkups, and less than optimal dental work. Myth #3: Children get cavities easier than adults. Although kids seem to get cavities more frequently than adults, the truth of the matter is they just aren’t as good at taking care of their teeth. If left on their own, my own kids would spend approximately 7.2 seconds brushing their teeth each night, if at all. I can’t adequately stress the importance of helping your children brush and floss each night. Like many habits, good or bad patterns usually originate in childhood. If you want your child to have a healthy mouth, teach them good habits and don’t let them get away with being lazy at the bathroom sink. Myth #4: Dental work makes a tooth stronger and more immune to cavities. Your tooth will never be as strong and resistant to decay as it was before cavities and cracks happened. Even crowns, although they can be beautiful and extremely resilient, are inferior to a natural tooth. All dental work has an inherent weak point – the seam between the natural tooth and the dental work (crown, filling, veneer, root canal, etc.) Even if it is bonded well, bacteria will always invade and compromise this area if you don’t clean plaque off of the tooth regularly and thoroughly. This is why we stress prevention so much at Canyon Gate Dental. Please brush and floss well, especially if you have dental restorations. 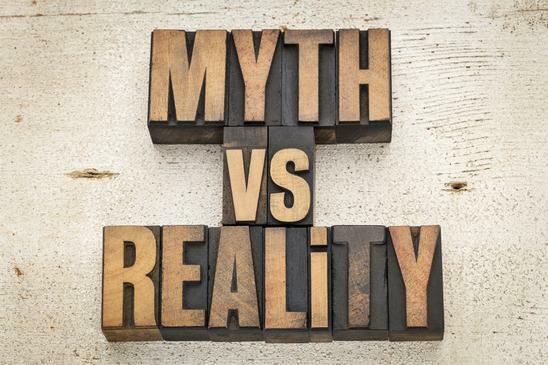 Myth #5: My gums are fine if I have no pain. Periodontal disease (gum disease) can sneak up on you very quietly. It only causes pain when it gets to a moderate or advanced stage. Even if you have great teeth that have never even had a filling, you still need to floss regularly for the sake of your gums. The most common reason teeth need to be extracted in this country is periodontal disease. Imagine having a beautiful Ferrari that you wash, wax, and keep looking beautiful, but never get serviced. Eventually that beautiful car will be totaled, not because it doesn’t look great, but because there are serious, unseen, and entirely preventable things that killed it from the inside. Don’t let your teeth go bad because you neglect your gums.